WHAT IS THE RITE OF CHRISTIAN INITIATION OF ADULTS or RCIA? The Rite of Christian Initiation of Adults is the “formational process” for adults seeking to become members of the Roman Catholic Church. This period of time concentrates on the total formation of the person. Time is given to sharing and explaining the beliefs, traditions, and practices of the Catholic Church; to praying privately, together and with the church community; and to be of service within the local church community and the wider community of the Diocese of Evansville and the world.. During this time the individual is given time to explore and ask those questions that are uniquely theirs. It is a gradual process that culminates with the individual’s decision of joining the Catholic Church and receiving the Sacraments of Baptism, Confirmation and Eucharist. The Rite of Christian Initiation of Adults is primarily for any unbaptized adult who wishes to become Catholic. It also invites those adults who, though previously baptized in another Christian religion, want to become members of the Catholic Church to witness their belief of the Catholic faith tradition by their “full profession of faith”. 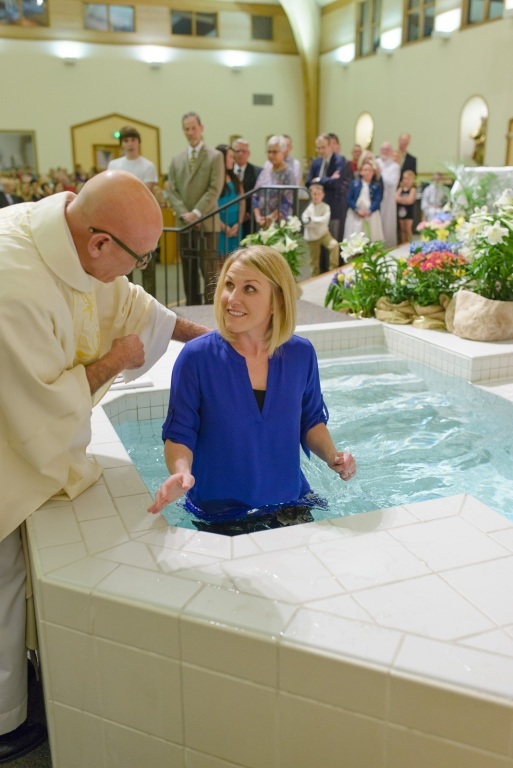 They are not “re-baptized”, but do receive the Sacraments of Confirmation and Eucharist marking their acceptance into the community of the Catholic Church. The core reality of Christian initiation and of Christian identity is “conversion”. This is the ongoing process of turning oneself more directly toward the presence of God – which is the way of life of every Christian. The Rite of Christian Initiation of Adults should not be compared to “adult education”, or any other parish renewal program or bible study, even though all these elements may be part of the process. The Second Vatican Council (1962-1965) called for the restoration of the Rite of Christian Initiation of Adults from the early years of the Church. This is completely different from the “private instructions” previously received by many non-Catholics who wished to join the Catholic Church. This process started being used by parishes in the United States in 1974 and has gained in use through the years. The initiation of new members can, and does, become the concern and responsibility of the entire community. By the quality of it’s life of faith, the community demonstrates how the true life of the message of the Gospel can be lived and shared. By the prayerful celebration of faith, the community visibly shares this message in their lives with others. The emphasis rests on communal living and sharing the faith. Evangelization and Pre-Catechumenate (also known as Inquiry). The Catechumenate; (time of deepening awareness of God’s presence through the Sacraments and prayer) . Period of Purification and Enlightenment (time before Easter Celebration filled with personal reflection, prayer, and service leading to the time of commitment of becoming one with the Catholic Church). Each period of the RCIA Process has a liturgical ” rite” or celebration marking the movement to the next period which is celebrated with the community during Mass. The parish community is always part of the journey of faith of all members through it’s witness and prayer. The period of the catechumenate can last for as long as several years or for a shorter time. It depends on how the person grows in their faith, what questions they encounter along the way, and how God leads them on this journey. During this time the catechumens consider what God is saying to them in the scriptures, what changes in their life they want to make to respond to God’s inspiration and what membership in the Catholic Church involves. WHEN DOES THE RITE OF CHRISTIAN INITIATION OF ADULTS BEGIN? The process actually begins when an individual begins to ask questions of “why?” in their own lives about their relationship to God, community and church. The actual period of Inquiry (the first formal stage of the Rite of Christian Initiation is the first “stage” of the process of conversion. Inquiry is that time to come together in a comfortable atmosphere and ask the questions one may have about the Catholic Church and what it means “to become Catholic”. For further information, contact Jay VanHoosier, Director of RCIA at the Parish Office, (812) 490-1000.